It has been specially designed for applications requiring an optimised Ug value. By using Pilkington K Glass™ OW on Surface 4 of an IGU, with another low-e glass on surface 2 such as the latest Pilkington Optitherm™ S1 Plus, it is possible to achieve Ug values as low as 0.9 W/m²K. 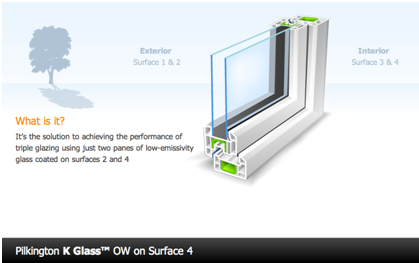 Put simply you get triple performance but with only two panes of glass. Pilkington K Glass™ OW has always been the preferred choice for its flexibility and versatility. It can be used in many applications, where either WERs or Ug values are a consideration. An advanced form of the original Pilkington K Glass™, Pilkington K Glass™ OW is chosen for its exceptional clarity as well as its environmental performance. The glass product provides homeowners with better light transmission, which allows for more free heat from the sun to enter the home – helping to reduce energy usage and therefore heating bills. The windows in your home not only let in the light to make rooms brighter, they also help to limit the amount of heat gain and heat loss into the room. Thermally efficient products such as a glass from the Pilkington K Glass™ range, maximise the free heat from the sun as well as ensuring that as little heat as possible escapes. Therefore making it easier and more cost effective to help keep your home warm.